Fifty ads at commuter rail platforms around New York state have caused quite a controversy over the past week. The ads, set to run for 30 days, feature maps of shrinking Palestinian territory from the foundation of Israel in 1948 to 2010. Henry Clifford, chairman of the Committee for Peace in Israel and Palestine, a member group of the US Campaign, paid for the ads. He says that the maps are "historically and geographically the truth" and can only serve to inform people of facts. 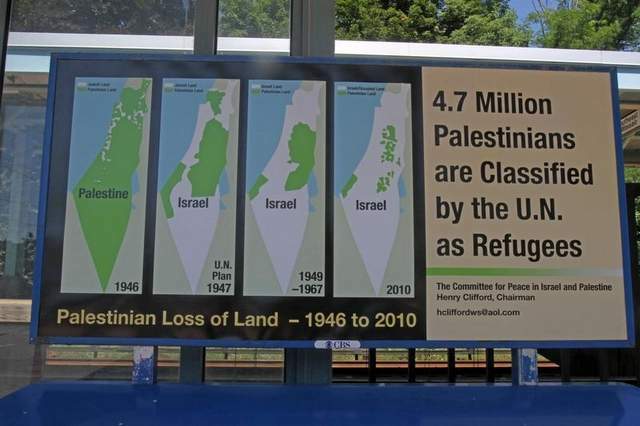 The ads have come under attack from NY council member Robert Castelli, who described them as "anti-Israel" and argued that they would not contribute to peace in the region. Ron Meir, New York regional director of the Anti-Defamation League, said: “The Israeli-Palestinian conflict is extremely complex and cannot be summarized in a series of four maps." To such criticism, Clifford has responded: "Those who disapprove of these ads, if they want to show they're inaccurate, they should bring that proof forward." The ads, run by CBS outdoor, come in the wake of that company's removal of Los Angeles billboards questioning U.S. military aid to Israel last month. Despite the opposition, Clifford thinks the ads will not be removed since he has a contract, and he can take legal action of its terms are violated. What do you think of these ads? Should they be removed? Contribute to the conversation by voting in a poll by the Chappaqua Daily Voice. Henry Clifford's advertisement at the Chappaqua Metro-North train station July 10, 2012. "Last night I talked to Henry Clifford, the 83-year-old Connecticut man who paid for the smashing ads on New York commuter train platforms that describe the dispossession of Palestinian lands over the last century...."